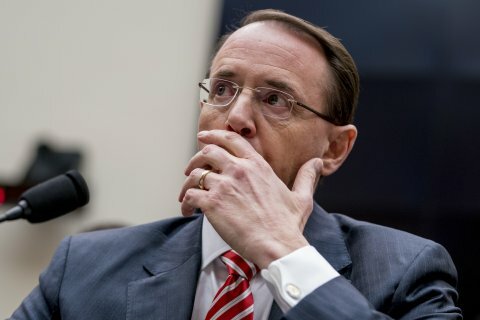 In what is the second major “leak,” to come from the FISA abuse memo, a new report reveals Deputy Attorney General Rod Rosenstein signed off on an application to extend surveillance of Trump campaign official Carter Page. Rosenstein assumed office on April 26th, 2017, approving the spy warrant merely three months after Trump was inaugurated on January 20th, 2017. U.S. Deputy Attorney General Rod Rosenstein approved to extend surveillance of former Trump campaign adviser Carter Page shortly after assuming office last spring, the New York Times reported, citing people familiar with a secret Republican memo. In June, The Gateway Pundit reported, Page sent a request to Rosenstein seeking the release of information used to allegedly obtain a FISA warrant to monitor his communications. Page, a former investment banker, was a foreign policy advisor to the Trump campaign. The Daily Beast‘s report comes amid the Sessions Justice Department calling on House Intelligence Chairman Devin Nunes (R-CA) to allow the FBI to review the memo to ensure its release will not harm national security. The second leak is confirmation of what Republican lawmakers have been hinting to the press for weeks; Justice Department officials were instrumental in approving the surveillance of Trump campaign officials. During a recent appearance on CNN‘s morning show “New Day” Friday, Rep. Chris Stewart (R-UT) told host Chris Cuomo that the “essence” of the “shocking,” FISA abuse memo centers around whether or not the FBI and Justice Department provided false information to the FISA court for the purpose of obtaining spy warrants. Rep. Matt Gaetz (R-FL) hinted this month that Rosenstein and demoted Justice Department official Bruce Ohr are both implicated in the memo, having asserted to Fox Business News that the two officials will be immediately fired after the “shocking” four-page document is made public.